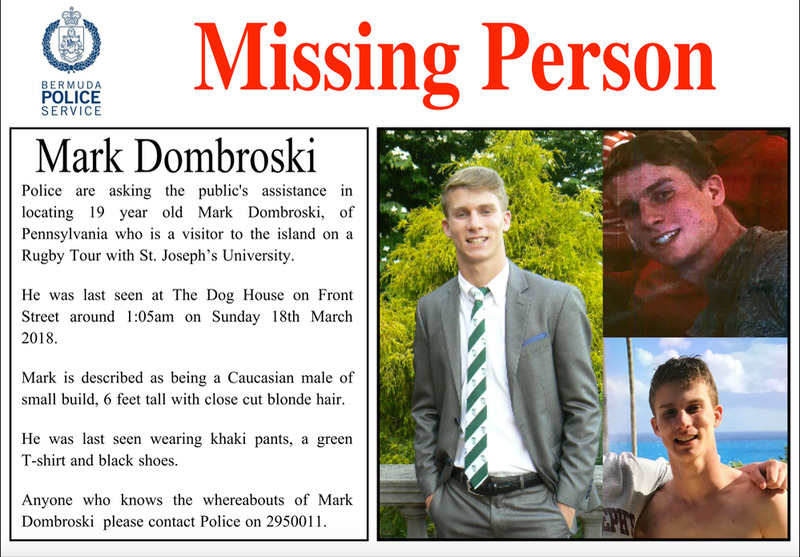 A 19-year-old St. Joseph’s University student has gone missing in Bermuda during a team trip. Mark Dombrowski was last seen at a bar early Sunday morning. The team was competing in the Ariel Re Bermuda International 7’s Tournament during the past week and was scheduled to return to the U.S. on Sunday. A 19-year-old college rugby player from St. Joseph’s University went missing over the weekend in Bermuda, and the local police have asked for help in locating him. Mark Dombrowski was with the St. Joseph’s rugby team competing in the Ariel Re Bermuda International 7’s Tournament over the past week. According to the Bermuda police, Dombrowski was last seen at 1 a.m., early Sunday morning. The team was scheduled to return to the U.S. on Sunday, but it is unclear if they made the trip,according to NBC10 in Philadelphia. Organisers for the tournament have offered a $US1,000 reward. The police have distributed the flyer seen above, both locally and through social media channels. On Saturday, the team posed for a photo on a beach in Bermuda. Dombrowski is from Claymont, Delaware.